I lived one year in Shanghai, very near to the St Regis Shanghai Jingan construction site. I was very curious to see how amazing that new luxury hotel was so I took the opportunity of my first return trip in the city to stay there one night, after few days at the well-known address The Puli. And how was it? Discover it below. 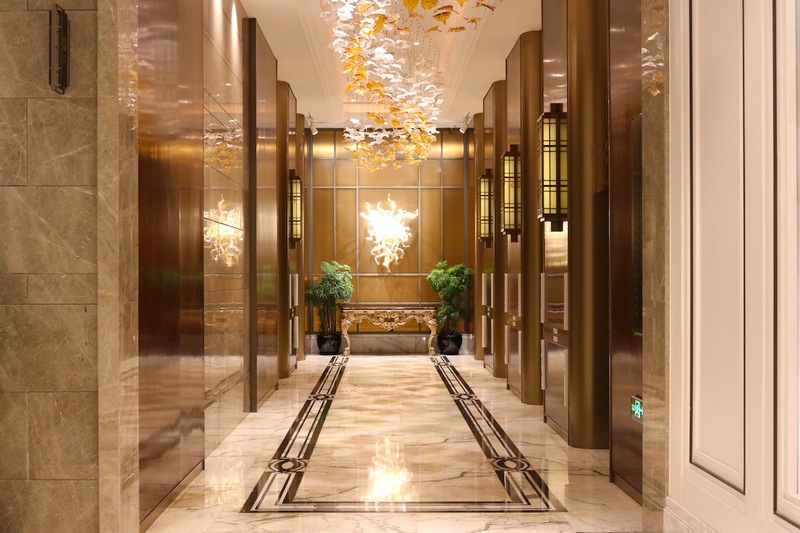 Located in Shanghai’s tallest tower on Puxi side (the historic center), St Regis Shanghai Jingan is a brand new address offering an opulent luxury for business and leisure travelers. Good point: it’s more than affordable for all the five-star standards proposed: indoor heated pool, Spa, beautiful common areas and gorgeous rooms from 36th to 55th top floors. Design at St Regis Shanghai Jingan follows one concept: classical opulent luxury with Art Deco touches. And it’s visible from the outside, with the impressive Art Deco entrance’s canopy surrounded by Asian art pieces. 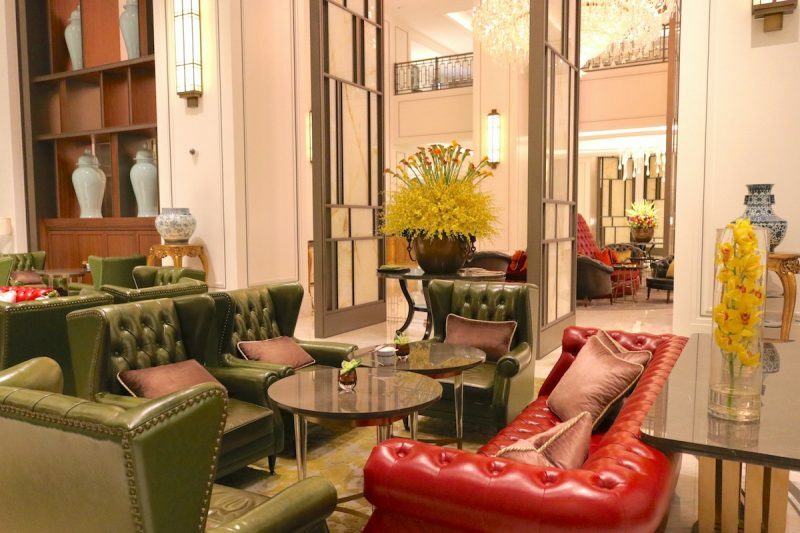 Once walking-in the lobby, you are immediately caught by its lavishness. It’s massive, it’s extravagant but chic at the same time. The perfect mix. I especially liked the succession of cozy spaces on ground floor, all with a specific atmosphere and color theme. Lovely! Do not miss St Regis Spa on basement floor, a large complex dedicated to relaxation with a range of treatments, a gym center and access to an indoor pool. More than just a hotel, it’s a destination in itself. I stayed in a Premier Deluxe Room on 50th floor offering corner windows with stunning views over Shanghai skyline. Interior design is similar to common areas, with some baroque touches on the top. Just look at curtains! Quality of furnitures and materials is really luxurious; the sofa on window side for instance is just gorgeous and so comfortable. Bed mattress and linen are top-notch, as expected for this hotel category, but I have to mention the wonderful – and quiet – night I spent there. Bathroom could be featured in design magazines (if not already), it is a masterpiece of style. First, it’s huge. 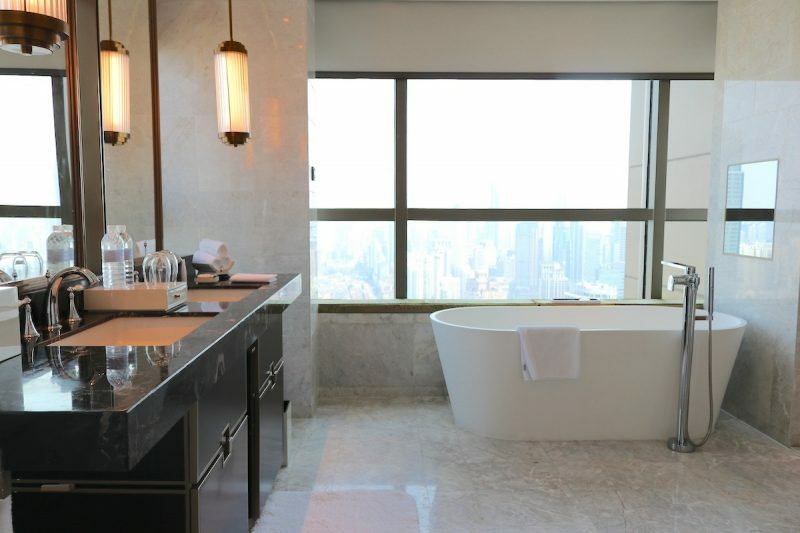 Then, it proposes a sumptuous standalone bathtub right next to window, facing Pudong skyline. Finally, the Art Deco furniture with mirror achieves to make this room a world-class accommodation. 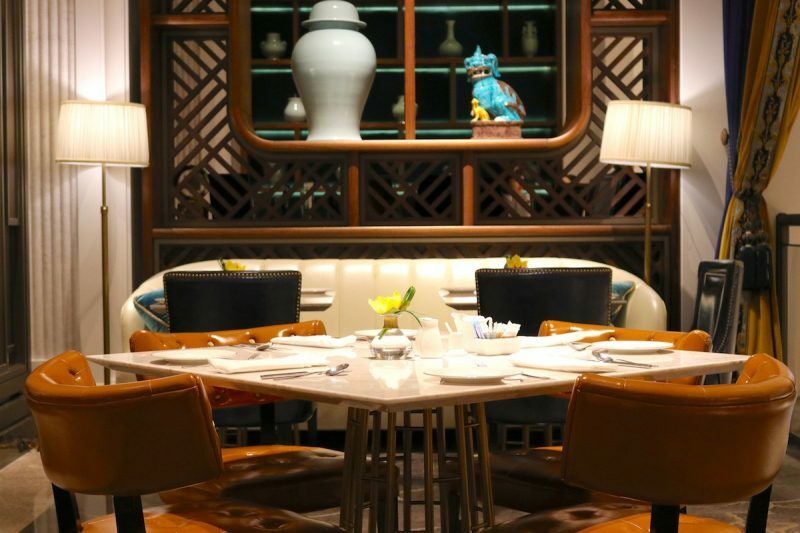 Social restaurant is the dining place at St Regis Shanghai Jingan. It proposes both a breakfast/lunch/dinner buffet and an a-la-carte menu, in a room with an Asian-baroque ambience and surrounded by many art pieces. Breakfast selection was huge – look at gallery at the bottom of this page – and I also tried the St Regis Club Sandwich for dinner. Nothing exceptional, just as expected; I guess a more “advanced” dish would have been more representative of the cuisine quality. Service quality might not be at the level of a Peninsula or Mandarin Oriental residence – a bit robotic – but staff are still very well trained and up to the job. I would like to particularly mention the Concierge team, who were very helpful and professional during my stay, helping me with my city tour and airport transfer. Thank you guys! 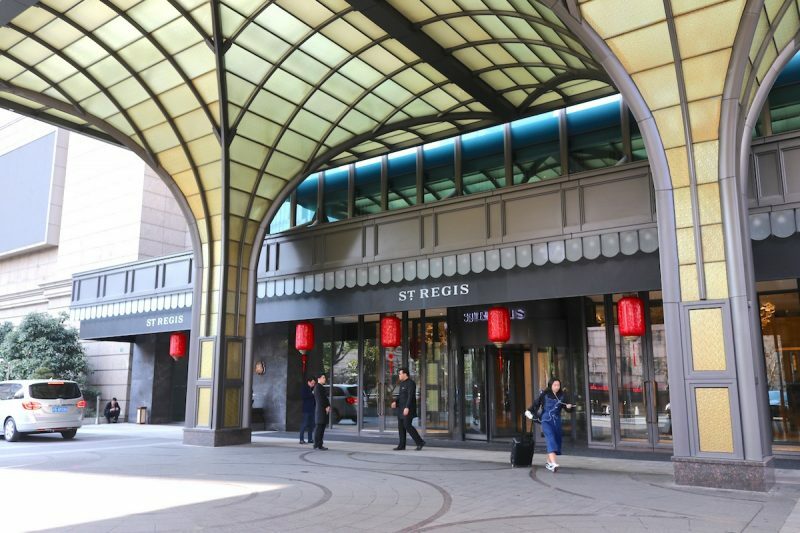 Because of its newness, St Regis Shanghai Jingan is definitely worth the value and because of its strategic location, it might quickly become a key place to stay exigent travelers. All the ingredients to make it the most attractive luxury hotel in Puxi side of Shanghai! Stayed from March 04th to 05th, 2018 – Unsponsored media stay. St Regis Shanghai Jingan opened in 2017 and is composed of 491 rooms and suites. 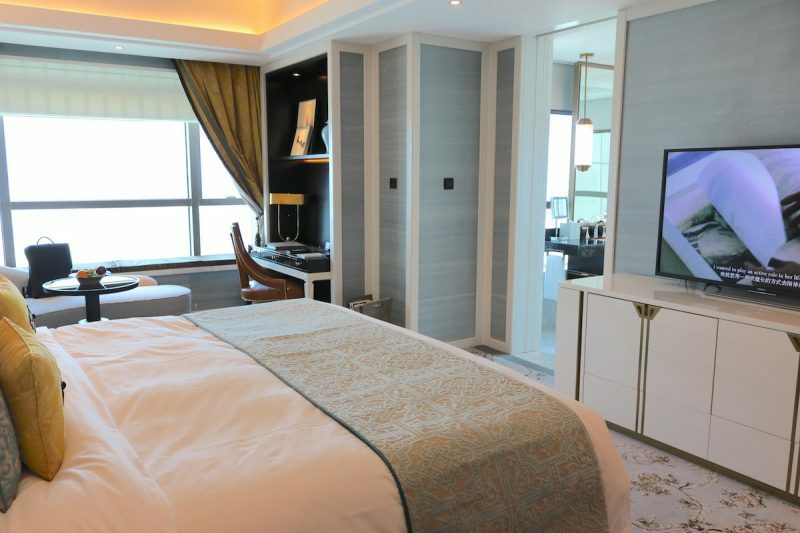 I stayed in a Premier Deluxe Room – around 60sqm – which public rate starts at CNY 2,180/night.